A recent report by a CAA member of a trout kill at Pejar Dam were investigated by DPI. Oxygen levels and temps were seen to be OK at the time of inspection and no dead fish found. Regardless, it was good to see our members keeping an eye on our waters and reporting in when things go wrong. This issue has a number of reports from related associations including severe problems during that recent heatwave at Gaden and actions being taken by the Council of Freshwater Anglers. Good to see JQ and Jaime again providing some interesting reading plus the report by Charlie and Lyall on our recent event at Lake Burley Griffin. Some news snippets discovered by Luke plus I report on experiments with waders in the pool. This entry was posted in Newsletter on March 6, 2019 by bill. This edition has commenced with a very thoughtful piece from our President (who later pointed me to a comprehensive article available here. In this vein, Leon spotted a significant fish kill in Pejar Dam. This has been reported to DPI through Steve Samuels. We await results from water testing that DPI are intending to carry out. Only limited reporting on angling – has it been just too hot for people to get out and about? Meanwhile a couple of reports of fish stocking in the local area. This entry was posted in Newsletter on January 25, 2019 by bill. Some really good reports here with a diversity of angling – not much on trout folks, what gives or are you having the same problem as Peter and I have had with finding our spotted friends. Many thanks to Ash, Evan, new member Jane, Luke and Lyall for material. 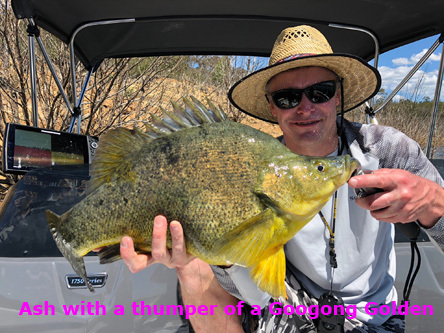 This issue has seen an addition to our occasional column on ‘Tips from Members to Members’ – thanks Leon for initiating a discussion on “how to fight big fish on fly” – also known as “how to put the maximum strain on fish”. This entry was posted in Newsletter on December 2, 2018 by bill. We haven’t heard from Owen in a while – and it seems we won’t see much of him either till Christmas. Retirement has given him the opportunity to hit the road. It was much appreciated to get some images and words from his time north. 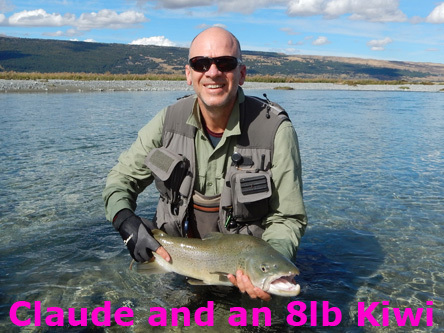 Thanks also goes to Claude for a report from the end of the season – good advice on offer here, though I’m a little concerned about how successful this squirmy has been (Lyle Knowles success also). My fly box has some very poor examples and I’d better get practicing. Jaime has come through with some snippets also – always got some hints on offer. 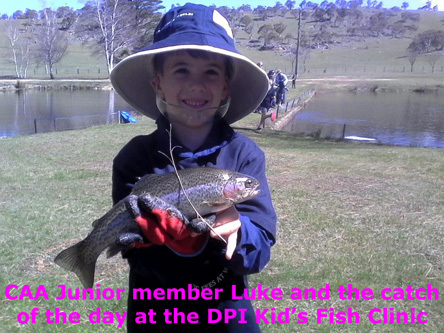 JM has a report here on the Kid’s Fishing Clinic plus he’s in print with CFA. Many thanks also to Lyall (can always be counted on to provide a topical item). This entry was posted in Newsletter on November 1, 2018 by bill. Bill’s provided me another chance at delivering you this month’s Newsletter and sadly as I put it together we received news of Life-Member Bryan Pratt’s passing. 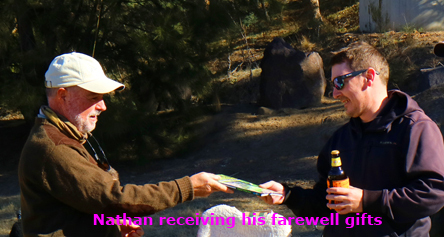 The club and fishing community will be a much different place without you Bryan. Thank you from all that you touched. This newsletter is packed with high-res pics and great information. I hope you enjoy it. Good luck if you fish the opening season and see you all next meeting. This entry was posted in Newsletter on September 28, 2018 by bill. Apologies for the six or so who have already read the Sep newsletter. This is what happens when I don’t get my co-editor JQ and some-time sub-editor Luke to proof my work. Eagle eyed Luke found two errors, now fixed. This issue covers our 2018 AGM with all the trophy results – well done to all awardees, but there is extra interest given we have four new trophies to compete for. The new committee and council was elected and recorded here for those who couldn’t make it. Many thanks to those who have stood up to help run the club. For those who love photos of fish and happy anglers, there’s plenty for you in this issue – in particular some mammoth cod courtesy of Ash and impressive trout from the Bondi Forest trip. Newsletters from external agencies like CFA are abstracted here. It is refreshing to hear that NSW DPI has acted on their promise of embracing science in the management of trout. The ‘Notable Fish’ board is back up and running – just remember to ensure that the fish are recorded in the official ‘green book’ if you want them considered for trophies. By the by, there’s been a change to our native fish assessment tool. Of course all of you who monitor the news on our webpage (or better still register to get notified each time something gets added) would have known about that. This entry was posted in Newsletter on August 27, 2018 by bill. This issue comes out just in time for our AGM. Don’t be frightened that you’ll be shanghaied into a job if you turn up – lots of work would have been done to ensure there are people willing to sign up to be on the executive. That said, becoming a part of that team is a great way to help shape CAA to provide what you believe is important for a club. If you want to make a difference, come along and put your hand up. 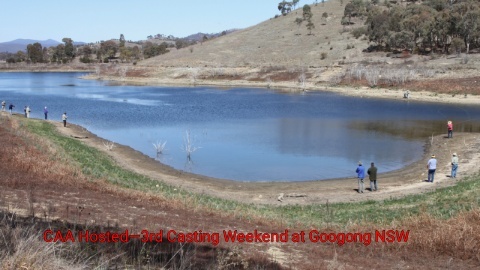 Was refreshing to see how many showed up for the casting instruction at Uriarra Crossing. Many thanks to John and Lyall for the photos – here’s hoping that others in the club could follow suit rather than leaving it to the ‘usual suspects’. Thanks for those who provided material for this issue—a bit thinner than recently, but perhaps a measure of conditions out on the water – check out Phil’s beauty at the end of the issue. This entry was posted in Newsletter on July 31, 2018 by bill. Fishing is a bit quiet, though I had thought I might have had more on the trout streams closure – seems water levels meant that it was extremely quiet. 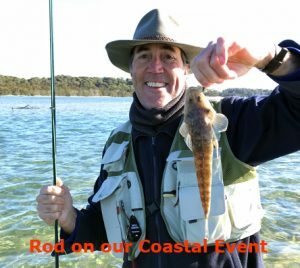 Lyall reports here on our Saltwater Event which was a lot of fun (always good to catch fish eh!). This is the decider for the Saltwater Trophy. In that vein, if you haven’t already brought in your trophies to Lyall, please do so at the July meeting so that they can be taken off to be engraved with this season’s awardees. The July meeting is also the last opportunity to register your catches in the ‘little green book’ – remember that inclusion in the “Notable Fish Recorded” section of this newsletter is not an official registration for trophy purposes. Good to see Luke, Lyall and JQ got into some fish after braving the weather and the mud. This entry was posted in Newsletter on July 5, 2018 by bill. Some very sad news as you’ll read in the newsletter. I’ve written up a recent trip by Ian, Lyall and me to New Zealand and then we have my report from the Tumut trip. It becomes starkly clear why I have to go to NZ as it has become obvious that I have big problems catching Australian trout! 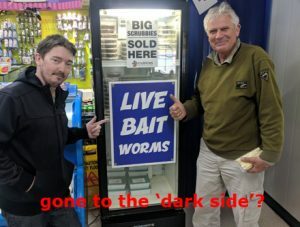 I hope the Trout Strategy will go some way to improving the trout situation ‘here’ in NSW, otherwise it seems I might need to move to Victoria where things seem to be going gang busters. 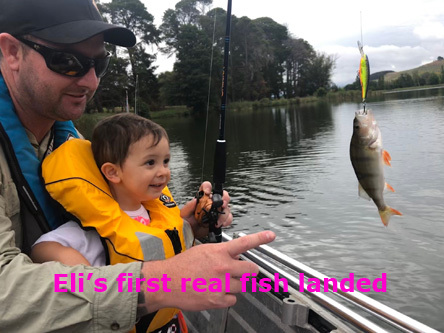 (My long weekend down the coast had only one ‘success’ when a pipi grabbed onto a treble hook – fingers crossed for better results when I go down with Lyall). Meanwhile, Luke and Nathan have had some great success on the rivers (probably European nymphing!). It took some encouragement for them to write up their experiences as they didn’t want to show up some of the old-stagers. 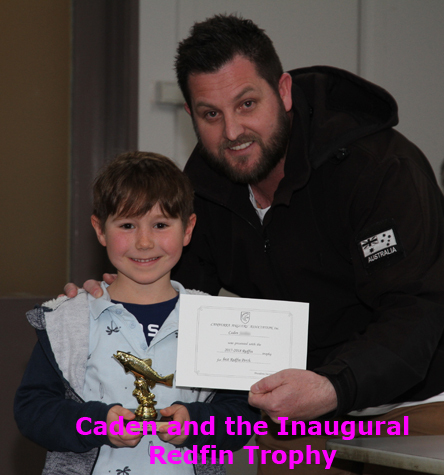 Ash has also provided a contribution covering his successes with Murray Cod. Beautiful fish. Many thanks to Jason Q and Luke for standing in for me last month – it is great to have such dedicated backup. Hope you enjoy the read, but still looking forward to your contributions folks. This entry was posted in Newsletter on May 31, 2018 by bill.